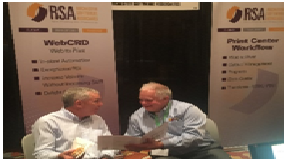 Xerox USCG Attendees Excited about RSA’s Solutions | Industry Analysts, Inc.
About 200 Xerox agent partners attended Xerox’s US Channels Group (USCG) Agent conference in Las Vegas las week. We saw attendees with renewed energy, excitement and optimism about the future. Leading RSA’s Sales and Business Development is Dirk Craib, who started his career in the industry over 20 years ago, working with long time Xerox agent, Mike Mitchell, of Office Equipment Source (pictured with Mike is RSA’s Mike Magley, of RSA’s West region). Xerox and their in-plant and corporate print center customers recognize RSA’s high level of customer service and satisfaction and ability to meet customer needs. As a Xerox Platinum partner, winning the production software partner of the year award 15 times, RSA and our Business Development team are recognized as workflow and production print experts. Working with RSA enables our partners to grow their business without needing to support these workflow solutions. RSA provides partners with presales support, demonstrations and quotes, and handles product installation and after sale support and training. If you have production print customers who need to decrease costs, increase the automation in their workflow and improve customer satisfaction, you’ll want to contact us today. For easy access to product information, sales presentations, cases studies, vertical messaging and more, sign up for an RSA partner resource portal account. Subscribe to RSA’s email updates to receive dealer and partner resources, news, tips, and information that you need to succeed. Has Web to Print Become a Business-Critical Application? This entry was posted in Rochester Software Associates, Xerox and tagged rochester software associates, USCG, xerox by IA Staff. Bookmark the permalink.